Last week we threw back 120 years to the spring and early summer of 1894. 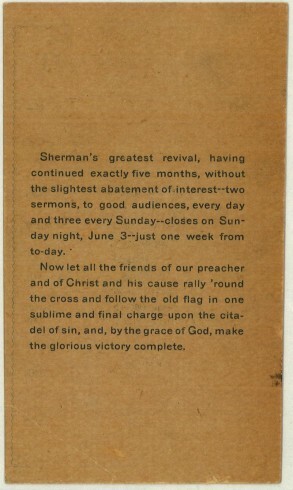 The Joe Johnson Collection, through a postcard-sized advertisement for the meeting, gives us a window into the practice of evangelism through the gospel meeting. 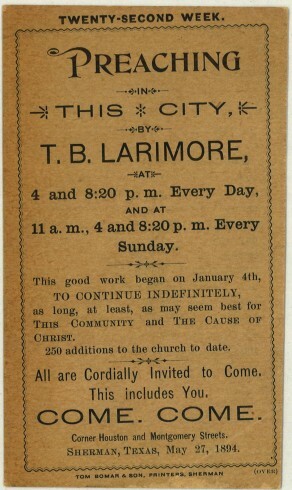 Albeit a long one at six-months’ duration, the Larimore meeting was all that typical for him as often preached twice daily and three times Sundays for weeks at a time. Designed for moment, that it survives a century later is wonderful. Paul and Mary Ann Garrett in 1997 donated to Center for Restoration Studies a small but fine collection of artifacts relating to historic sites of the Stone-Campbell Movement. 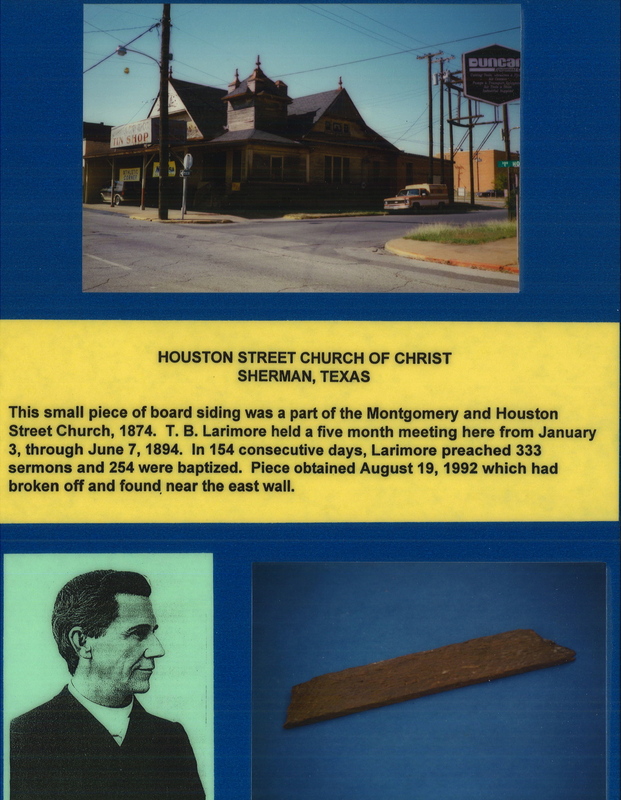 Among those artifacts is a piece of wood from the Houston Street Church of Christ in Sherman, Texas. Though it is not in fact the building in which Larimore spoke during that long meeting, it is nonetheless a tangible reminder of a historic congregation. Presumably the Garrett’s snapped this photograph on 19 August 1992 of the northwest corner of Houston and Montgomery in Sherman, Texas. To accompany each artifact, Paul and Mary Ann made large placards with a photograph of the item and photographs of the persons or places involved. Here is their placard for the Houston Street Church. This building no longer stands (it burned in 1998), but the congregation continues today as Western Heights Church of Christ. How fortunate we are to be custodians of an artifact from this church building and an artifact from the great meeting in 1894. Housed in a climate-controlled and access-controlled facility, they are both available now for research and study in person in Abilene and through this blog, around the world. Now…do you have something to add to what we know about this congregation, this evangelist, this building? Do you have a photograph of the original ‘t-shaped’ building that housed the Houston Street Church prior to 1907 when this building was constructed? This congregation becomes, after a new building is constructed in 1920, the Walnut Street Church of Christ. Did the congregation publish a directory, or bulletins or other news items? Is there an extant photograph of the interior of this building or of the one in which Larimore spoke? Did anyone in your family attend this congregation? What stories about it have been passed down in your family? If you can shed additional light into this moment from our past, will you consider sharing it with the Center for Restoration Studies for preservation, study and research? If so, contact me at mxi13a@acu.edu. 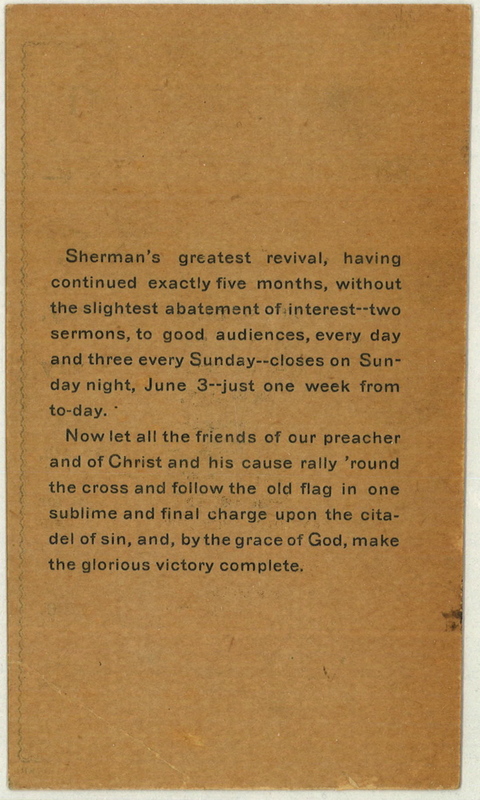 Among the remarkable items in the Joe Johnson Collection of American Christianity is this post-card sized handbill advertising…in its “twenty-second week”…what is likely the longest sustained evangelistic effort in Stone-Campbell history. Theophilus Brown Larimore by 1894 engaged in such meetings on a full-time basis. He was in demand for them because of his ability to communicate clearly, forcibly and persuasively. 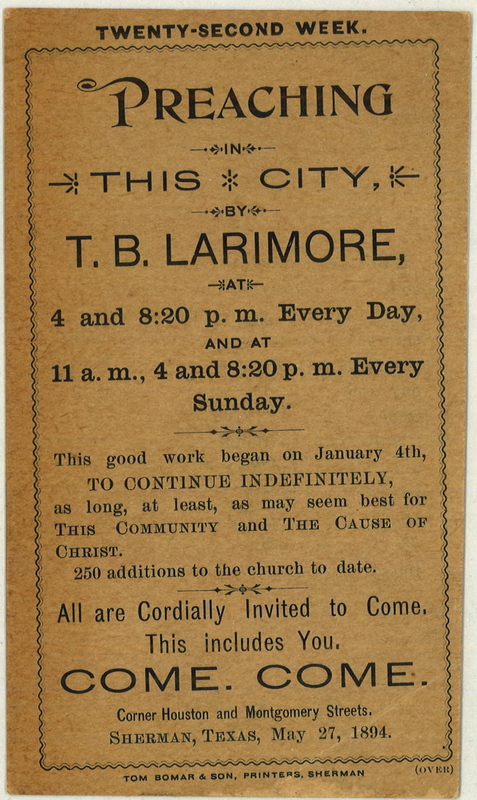 While weeks-long meetings were not unheard of (and commonplace among some evangelists) this effort by Larimore is an outstanding example of the stamina on the part of all concerned. In 2014 we marvel that audiences sustained his effort, and that he was able to maintain such a rigorous schedule (twice daily and three times each Sunday). I’ve heard it said Larimore remarked that he did not repeat a sermon during these six months. In the larger story of Churches of Christ, this meeting held far-reaching effects, for during it Larimore persuaded a young man to become a Christian. Batsell Baxter, a boy of seven years, was baptized during this meeting. Batsell’s imprint on higher education among Churches of Christ, and through it the impact he had nationwide, is likely inestimable. After training at Nashville Bible School and Texas Christian University he taught at Thorp Spring Christian College, Cordell Christian College, Abilene Christian College, Harding College and David Lipscomb College. He served as President of Abilene Christian College, David Lipscomb College, and George Pepperdine College. Baxter’s only child, his son Batsell Barrett Baxter, trained generations of preachers at George Pepperdine College and David Lipscomb College and served for years as radio and television speaker for Herald of Truth ministry based out of Abilene. That’s quite a story from a single handbill. UPDATE: there’s more…click here for part 2!